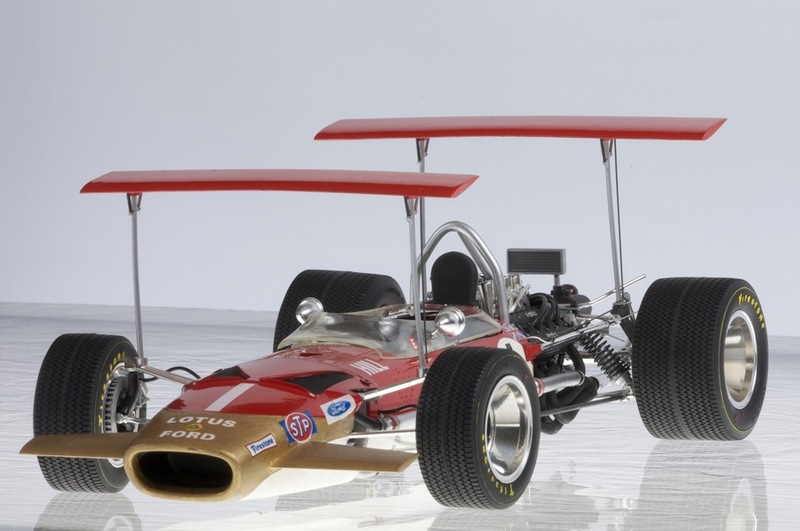 This model built in 1993, represents that driven by Graham Hill to second place at Kyalami in South Africa. Here, the 49B’s were well developed and running a Hewland FG400 gearbox since the debut Grand Prix, Monaco ’68 (pole position and victory). The new gearbox replacing the ZF was part of the defining features of the new car, the other notable characteristic was a major revision of the rear aspect of the monocoque where the rear lower radius rods were now buried within the tub via triangular cut-outs to obviate the repeated concerns about the insufficiently strong mountings on the outside of the tub during 1967. The front rocker arms were now inclined forwards from their usual perpendicular orientation (in plan view) and changes to the rear suspension included a redesigned cross member to take suspension loads through the gearbox casing rather than the rear cylinder heads as on the 49. 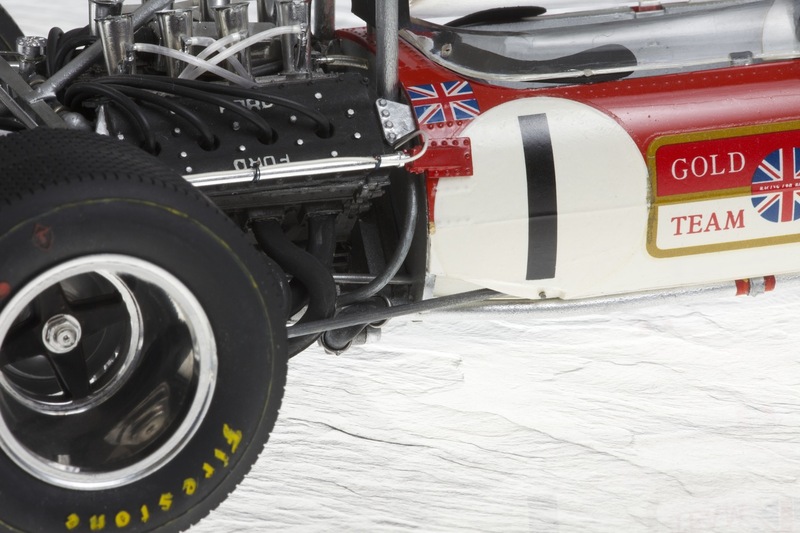 The magnesium wheels were deeper coned, nose wings applied and many other smaller less visible improvements, some of which were to come later in the 1968 season, such as a horizontally split nosecone to allow accommodation of the deep-set hot air exit ducts from the front water radiator. On the gearbox mounted oil saddle-tank a small oil cooler was fitted, removing the need for extra oil pipes forward to the nose radiator. For 1969, new regulations meant that an on-board fire extinguisher, new-style more substantial roll-over bars, seat belts and fire saftey triggers/external cockpit notation were now mandatory. 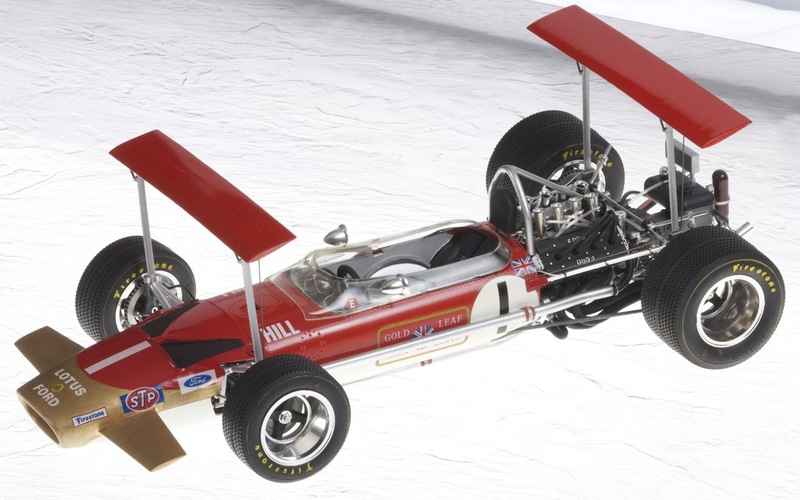 This 1969 car demonstrates the almost unrestricted enthusiasm for wings which had started in a small way during the 1968 mid-season to become all-the-rage at the end of 1968. 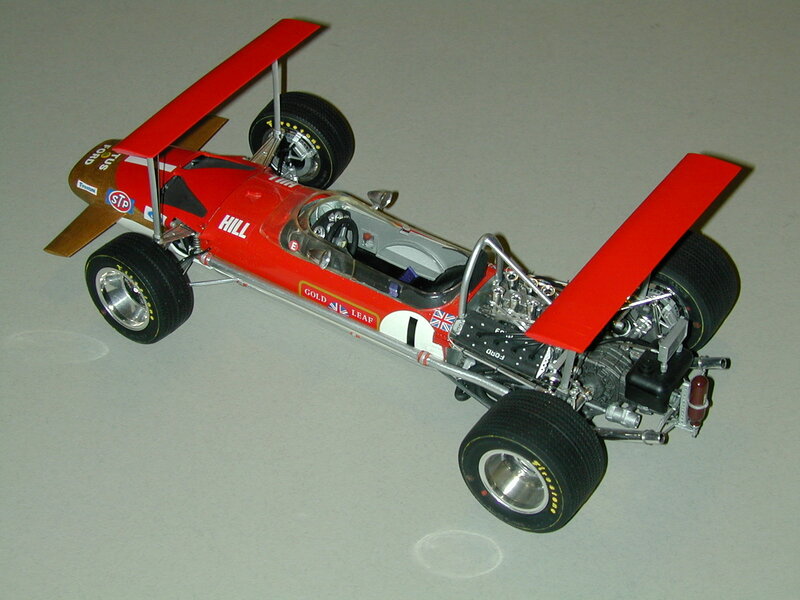 For 1969, Colin Chapman overstepped himself in the production of ever bigger strutted wings at the Spanish Grand Prix (Montjuich Park) where both works cars suffered severe accident damage after wing failures during the race, Hill first and Jochen Rindt shortly after, the latter being quite badly injured. After practice for the Monaco Grand Prix, such high structures mounted on the wheel uprights were banned, thereafter much smaller wings mounted on the engine or monocoque being allowed after CSI regulations came into effect at the Spanish Grand Prix. Hill only managed to finish seventh in the World Championship for drivers behind Jackie Stewart (Hill’s former BRM team mate) who was driving a Matra MS80, whilst Hill and Rindt winning single Grands Prix apiece, could only secure third place in the Constructors’ title. This was one of my earliest true conversions, in that I employed additional parts to enhance a standard Lotus 49 model, acquired as a part-completed, parts-missing model in about 1983/4, from a shop in Edinburgh for £5, whilst studying at University there. Having built the model as best I could in about 1984, some ten years later I decided to put it to good use and applied a Cosworth DFV and Hewland gearbox from another kit; not having another kit from which to sacrifice an engine and gearbox, I suspect I harvested these from my very first original model, a Lotus 72D which I was given at the age of 13 for Christmas in 1975. Over the years it deteriorated and found its way into the spares box, the rest of the unused parts of the car, still being there. The 1969 regulation roll-over bar (being properly useful when compared to the 1968 offering), was made from brass rod and applied, also the onboard fire extinguisher, the new 5 g- capable head rest (for possible rearward impact protection), seat belts and safety equipment notification, on the cockpit sides. Additionally, some super-detailing involved wiring behind the dashboard and most obviously the conversion of the 49 car to the 49B with lower monocoque rearward cutouts to accept the more forward locations of the rear lower radius rods. At the same time, oil and water pipes were made and set in cut-outs along the lateral floor of the monocoque. Further evidence that some of these improvements (engine and gearbox) came via my very original Lotus 72D model, was that the fire-extinguisher placed behind the gearbox in this 1969 car, appears to be an ex-Lotus 72D Graviner fire-extinguisher which was fitted on the front subframe in the later car. The decal set provided with the 1968 Lotus 49B kit (misnomer and incredible Tamiya oversimplification, except for colour scheme) fortunately allowed for the 1969 arrangement and I was able to utilize the outrageously tall aerofoils to illustrate this particular stage in the evolution of Grand Prix cars (mid to late 1968 through to early 1969). Therefore, a race prior to the diasterous 1969 Spanish Grand Prix was chosen, namely the South African Grand Prix. After the first practice session at Monaco, such wings were banned and regulations stipulated more structurally sound wings of limited dimension and height, enforced from the Dutch Grand Prix onward. This model was built with limited materials, equipment and skill some eighteen years ago, completely brush painted with Humbrol enamels and yet it retains the charm and flavour of Grand Prix cars of the era, the 49/49B being one of my favourites. Also, Graham Hill was a wonderful character and if you haven’t read his first significant autobiography (Life at the Limit) you will be in for a real treat… so humorous.